Several months ago, a friend shared a link to a website that maps fruit (and nut) trees in urban public spaces, i.e., an urban foraging map. The concept kind-of boggled my mind. I mean, even if the tree/bush/vines produced more than you could consume and preserve, why not share the information with a small, select group of people, ensuring that your source wouldn’t be overwhelmed? Apparently some people don’t share my reservations, as they are sharing their spots for edible treasure at FallingFruit.org. Anyhow, when I checked the map for nearby options, I discovered a marker for pawpaw trees, saying that the fruit ripened in early September. 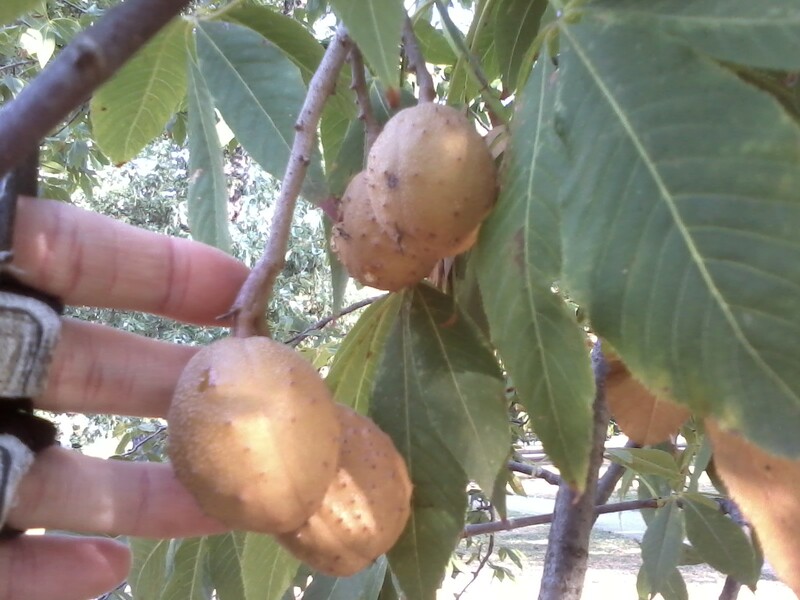 We have a pair of pawpaw trees out at the garden, but they’re babies and won’t bear fruit for a few years. Pawpaws are unreliably available at the farmers’ market, and you pay a premium. Time to forage! After double checking the map, and the description of the tree as “tropical looking” I headed out on my bicycle early Saturday morning. I arrived in the indicated area, and spotted a tree that looked promising . . .
. . . or not. Despite leaves that could possibly be described as “tropical looking,” I quickly determined that cone/fruit thing was not a pawpaw. 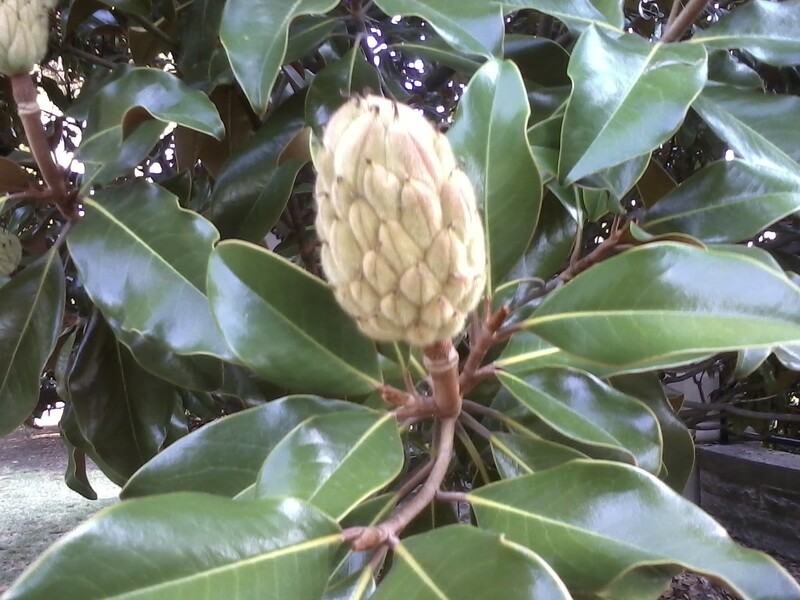 And yes, if I had a bit more tree identifying experience, I would have known right away that the tree in question was a magnolia. I did a bit of off-roading, circling the indicated area on my bike, looking for other likely subjects. Finding none, I did a quick check of another section of the park, thinking perhaps the marker on the map was placed incorrectly. That effort yielded this fruit, perhaps a walnut? Or some other kind of nut? But still no pawpaws. Were they just not there? Had the trees not set fruit this year? Had someone misidentified it? I headed home at that point, wanting to beat the heat and more intense sun rays. I would have been quite annoyed had I used the car and struck out, but, as it was, I got a nice bike ride out of the deal. I reviewed the maps and website again for this post and realized that my exact foraging location was based on some kind of Google maps foraging tool, and not the map at Falling Fruit. The FF map shows a slightly different location for the pawpaw trees — kind-of the same area, but different enough to be outside the area I searched, so now I’m debating a return trip. Your Turn: What would you do with fruit foraging locations, share or keep it quiet? 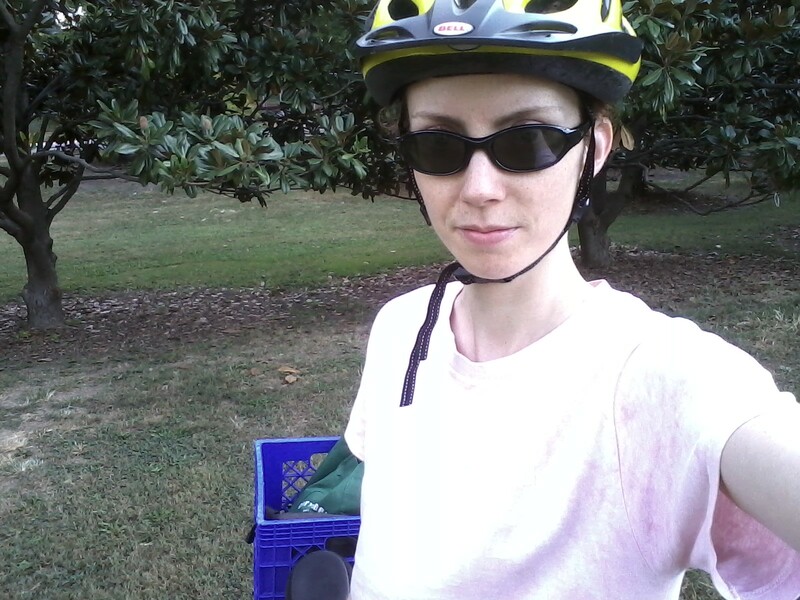 This entry was posted in Biking, Food and tagged eat local, foraging. Bookmark the permalink. I know, right? Why would you share that information? Perhaps fruit foragers are a different breed than mushroomers 😉 I seem to be a mushroomer at heart, despite only going on a few forays, and not for a couple of years now. I was going to try again on Sunday morning, with the updated location information, but it didn’t happen, due to rain and a tomato canning project. Not sure if/when I’ll get back there at this point. Maybe next year?